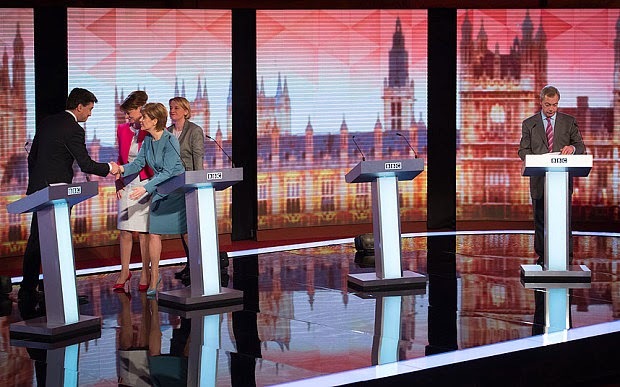 SHE INSPIRED HER: Female Politicians Embrace Onstage after the BBC Challengers Debate and inspire women everywhere! Female Politicians Embrace Onstage after the BBC Challengers Debate and inspire women everywhere! After a healthy 90 minute debate about the budget deficit, immigration, housing, Trident and the NHS, the three women; The Green Party's Natalie Bennett, Plaid Cymru's Welsh Politician Leanne Wood AM and Nicola Sturgeon of the SNP, walked towards each other on stage as the credits rolled on our television screens, and joined in a group hug. It was pretty apparent that it may well have been the men on stage who were in need of a hug after the very spicy battle of politics; although the women did then shake hands with Labour Leader, Ed Miliband shortly after their female embrace, while Nigel Farage could only be seen looking on awkwardly alone in the distance. This just goes to show again that women can have differences in opinions, work in different industries or work in the same industry on different teams and we can STILL remain grounded, professional, dignified and inspiring to other women watching us! Everyone take note and continue to be an inspiration! JUST ONE DAY LEFT TO REGISTER TO VOTE! If you are seeking to vote in the UK Parliamentary general election that is taking place on Thursday 7 May 2015, the deadline for receiving applications for registration is Monday 20 April 2015. We strongly encourage everyone to register as soon as possible! Years ago none of us women would have had the priveledge! So make your voice heard today by registering to vote and having your say on who runs the country!